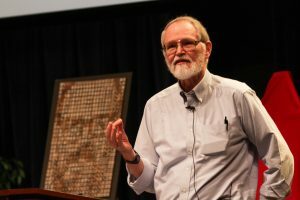 AT&T as a whole had “well over” a million employees, Kernighan remembers, making them America’s single largest employer outside of government. Their dominant position as the phone company for most Americans gave them a very stable revenue stream, and research represented only a small fraction of the company. “In some sense, it didn’t matter as long as this collection of people produced things that were useful,” he remembered. 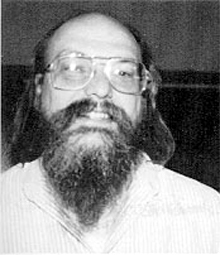 He didn’t meet Ken Thompson, the creator of Unix, until 1967, but eventually, he and Dennis Ritchie were all in the same organization as Kernighan. And this brings us to the moment when Thompson invented grep. The original Unix Programmer’s Manual calls grep one of “the more memorable mini-revolutions” that Unix experienced, saying it irrevocably ingrained the “tools” outlook into Unix. “Already visible in utilities such as wc, cat, and uniq, the stream-transformation model was deliberately followed in the design of later programs such as tr, m4, sed, and a flurry of language preprocessors.” grep, of course, is used when searching for text patterns — whether that text is coming from input files or from “piped” text (output from another command). In another interview with Computerphile, Kernighan suggests it was these low-storage environments that also gave rise to Unix’s pipe operator. “It’s possible that if you took the output of one program and had to store it, totally, before you put it into the next program, it might not fit… And so you couldn’t instantiate, necessarily, the output of a program before passing it on to the next program. Comment from discussion mrcrassic’s comment from discussion "Where GREP Came From – Brian Kernighan". ed let you specify regular expressions, which appeared between slashes, along with some operations (specified outside those slashes) to perform on the lines which matched. The operations were often indicated with a single letter, like ‘p’ for print or ‘a’ for append. And there was also a ‘g’ flag which stood for global and would perform a command not just on one line, but on every line of a file (that matched the specified regular expression). For example, that print command, “p”. “He sent this to Ken Thompson, and then went home for dinner or something like that. And he came back the next day, and Ken had written him a program. Comment from discussion vishnoo’s comment from discussion "Where GREP Came From – Brian Kernighan". Comment from discussion syntax_erorr’s comment from discussion "Where GREP Came From – Computerphile". “Let me add one thing,” Kernighan remembers with a laugh. Twenty-five years ago, in the spring of 1993, he’d been teaching as a visiting professor and needed an assignment for his programming class. So he provided his students the source code for ed — “It was at that time probably 1800 lines of C” — and told them to do what Ken Thompson did. Interestingly, Kernighan told Thompson back in 1993 that he was assigning the problem — and the historical record will show that he received this response from Thompson. looks like a very good assignment. it stresses reuse and cleanliness rather than grunt. Comment from discussion porlov’s comment from discussion "“grep was a private command of mine for quite a while before i made it public.” -Ken Thompson". 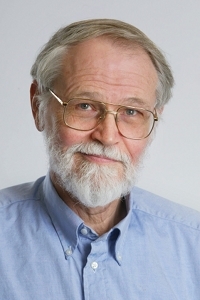 When Computerphile’s interviewer had asked if the pipe operator is also still being used today, Kernighan replied emphatically, “Oh, absolutely. It’s still a fundamental mechanism. You use it all the time. The origin of HTML’s infamous blink tag. Remembering the early days of Google and Facebook. How two strangers set up Dropbox and made billions. Impressive results in this year’s robot art competition. Biometric tickets are here — and they’re coming for Major League Baseball. Can you teach a computer to guess which a century a painting was painted in? 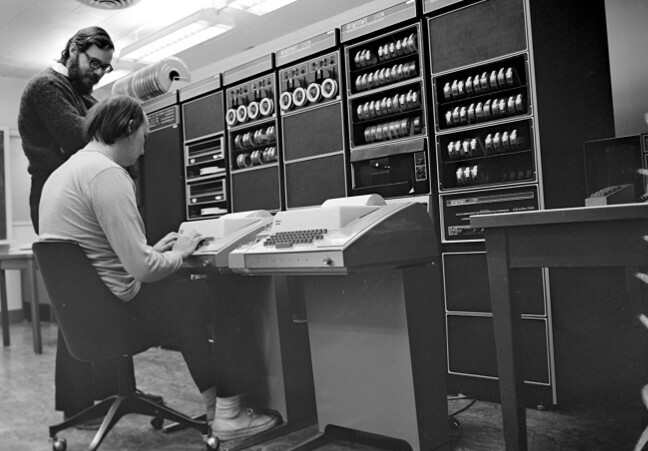 Feature image: Ken Thompson (sitting) and Dennis Ritchie at PDP-11, Wikipedia.